You have probably already heard many times that brown rice is much better for you than white rice. Beyond that though, you might be wondering just why that is. If you like eating rice but want to maintain good health, switch to brown rice. Here are nine benefits you will get from eating brown rice regularly. Selenium is a very important mineral that your body needs, and brown rice is highly rich in it. Selenium has been shown to repair DNA repair and damaged cells, and to stop the proliferation of cancer cells or abnormal cells. Therefore, getting enough selenium drastically reduces your risks for developing illnesses like cancer and heart disease. 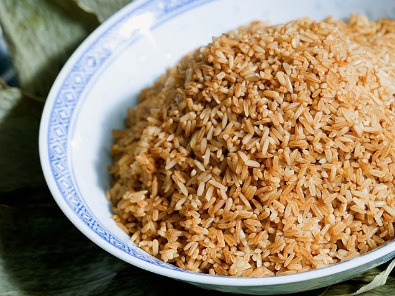 In just one cup of brown rice, you will get 80% of your daily manganese requirement. This mineral helps your body process fats and keeps your nervous and reproductive systems running optimally. It can also help you sleep better at night. Your body needs healthful fats to keep your cholesterol level at a normal level. Brown rice has these naturally occurring oils in it in the perfect dosage. Brown rice is packed full of fiber. Fiber is essential for proper bowel function. Plus, it really fills you up. Serving brown rice with your plate of steamed vegetables will keep you fuller for longer, which means you will not wind up gobbling up excessive calories. Unlike white rice, brown rice is a true and real whole grain. It has not been refined which strips it of the good qualities it has. Whole grains have been shown to prevent the build-up of plaque in the arteries. They also keep cholesterol in check and reduce your risk for heart disease. Antioxidants keep free radicals from causing cellular damage. The more of them we get in our diet, the better. Brown rice provides a mega dose of antioxidants, as much as the other superfoods we are told to eat for antioxidant properties like berries. Recent studies have shown that if you eat just a half cup of brown rice on a daily basis, you will reduce your chances of developing Type 2 diabetes by as much as 60%. Brown rice helps to stabilize your blood sugar level so it is a great choice for a grain on your plate, unlike white rice which can increase your chances of developing type 2 diabetes. If you have a baby, do not start them off on those mushy rice cereal solids. Give them brown rice or brown rice cereal. The natural composition of nutrients and the filling fiber will give them everything they need as they transition into eating real food. Brown rice flour is a perfect substitute for regular flour. Now you can make pancakes, breads and other tasty baked items healthy. You can also use brown rice in soups and stews. Brown rice is quite simply nutritious and delicious. Once you make the switch, you will not miss white rice one bit.